Crazy speeds being reached on the circuit this week in perfect conditions. I struggle with the TT now. The riders keep showing up and clearly like going there but it's not racing I can watch. 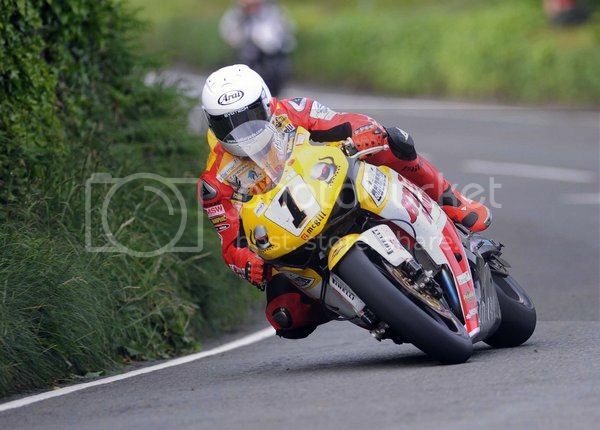 I'm still pissed off at the TT for killing Dave Jefferies, and plenty of others over the years. I genuinely find it hard to watch too. 2 Killed already at this years TT. Its one meeting that almost always ends in the sad death of at least one competitor. But these guys know the score and as its not shown "Live" you may see accidents but not tragic deaths. I still love it although always hoping each race is incident free. The Macau race is reckoned to be the most dangerous road racing nowadays and the NW200 in Ireland has its share of accidents. Its like MotoGP, Indycar and F1 in that every rider/driver knows the score before racing. Its a dangerous sport. Hutchy won today with an average speed of 133 .6 mph. Geezus 133.6 miles an hour average = BIG ball territory that ! This clip isn't too shabby either. ^^ Not too shabby at all. Great rider and personality destined never to win at the TT I fear. Yep - Guy will see time slip by, but end up a wealthy man - if he doesn't kill himself with one of his crazy stunts !